There was a little of everything for boxing fans in 2018, including evenly-matched fights, upsets, and highlight-reel knockouts. Thank goodness boxing promoters worked together to make these fights or sanctioning bodies mandated the fights to be made. Could we get more like these in 2019? Absolutely. There is the elephant in the room in that certain promoters will not work with other promoters. There is also the aspect of fighters aligning themselves to certain networks or streams, which could prevent fights boxing fans want from happening. 2018 was a solid year, and the hope is 2019 will be the same, if not better. Here are 10 fights that boxing fans will likely see in 2019. Their first fight on Feb. 24 was a solid fight that produced an epic 12th round. Promoter Tom Loeffler would love to do a fourth installment of SuperFly and this fight would likely headline. Estrada, who is coming off an seventh round knockout win over late-sub Victor Mendez on Dec. 8, is the mandatory challenger for Sor Rungvisai’s WBC title. Sor Rungvisai last fought on Oct. 6, where he defended his title against Iran Diaz in his native Thailand. 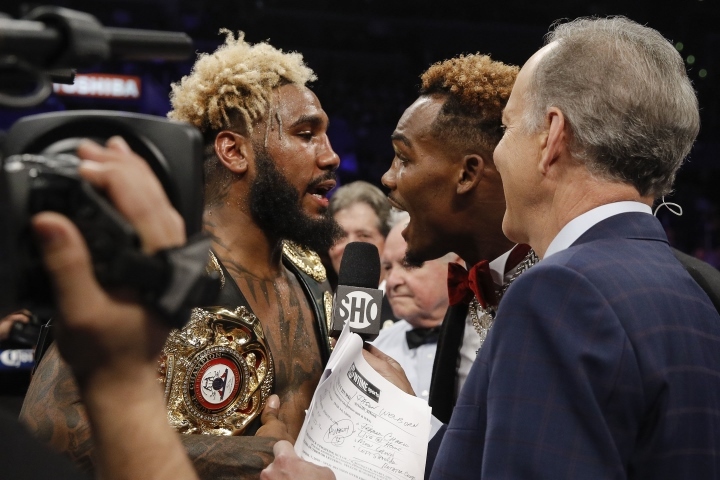 Despite the loss to Tony Harrison, where he lost his WBC title in the process, Jermell Charlo and Jarrett Hurd are two of the top junior middleweights in boxing. I could see Hurd defending his IBF title against mandatory challenger Julian Williams, while Charlo fights Harrison in a rematch in the early part of 2019. If they both win their fights, Hurd-Charlo would be a compelling unification fight later in the fall, one where Hurd would be the favorite. While the World Boxing Super Series (WBSS) tournament at 140 pounds will play out with the semi-finals and finals later this year, Jose Ramirez needs another fight, assuming he defeats Jose Zepeda on Feb. 10. Regis Prograis (the interim titleholder) and Josh Taylor (mandatory challenger) are in the tournament, so that rules them out. Linares is now campaigning at 140 pounds and has a fight lined up on Jan. 18 against Pablo Cesar Cano. A Ramirez-Linares would be a solid fight, one the WBC would likely endorse, considering Linares held a world title at 130 and 135 pounds. Linares more than held his own against Vasiliy Lomachenko on May 12, a fight that aired on ESPN and where Linares scored a knockdown. Promoters Bob Arum and Oscar De La Hoya have had a hot-cold relationship, but I can’t imagine both of them not signing off on this fight. Dillian Whyte had a highlight-reel knockout win over Dereck Chisora on Dec. 22 and is the mandatory challenger to face Joshua for his WBO title. Joshua is penciled to return to the ring on Apr. 13 at Wembley Stadium outside London and Whyte would be the right opponent for that card. Word is Joshua could instead fight in New York City on that date. Miller would be a perfect opponent for Joshua, considering he is ranked four by the WBO and number two by the WBA. Miller is also from the Brooklyn area and has the gift of gab. With Joshua facing either Miller or Whyte on Apr. 13, that means Wilder would need an opponent for the first half of 2019. Why not face Fury in a rematch of their Dec. 1 fight that ended in a draw? What other options would Wilder have if Joshua does fight Whyte or Miller? Wilder could fulfill his WBC mandatory and face Dominic Breazeale, but fight fans would rather see him face Fury, who is the linear heavyweight title. The fight could be held in Wembley, New York City, or even in Las Vegas. It is expected that Santa Cruz will win a one-sided decision or stop Miguel Flores on Feb. 16 in Los Angeles. With Russell fighting once a year, why not have both fighters square off in June or July? It would be a unification fight and the winner will likely be labeled the best fighter at 126 pounds. The site of the fight will be interesting. Would it be held in the Los Angeles area, where Santa Cruz resides, or near Russell’s home in suburban Washington, D.C.? Both are advised by Al Haymon so it would be a surprise if this fight DOES NOT get made for 2019. Another fight that should take place in 2019. No need to let this fight marinate. Both fighters do not like each other. Both fighters call each out on social media. Both fighters have a world title belt at 130 pounds, so unifying both titles would be an incentive to both. Since both do not like each other, both will want to knock each other out or beat the hell out of one another. But the issues of networks come into play as Davis has lately fought on Showtime and Farmer has a deal with DAZN. If they each want the fight, both can make sacrifices. It is easier said than done, but a significant purse and unifying the world title belts should win out. At least, one would think they would. Staying at 130 pounds, this fight is a candidate for ‘Fight of the Year.’ Each has a world title belt (Berchelt owns the WBC title, while Ito holds the WBO belt). Fight fans are familiar with Ito with his win over Christopher Diaz on July 28 to win the WBO belt. Berchelt stopped Mickey Roman on Nov. 3 in another defense of his title. Berchet is promoted by Zanfer, while Ito is co-promoted by Top Rank. Both promoters have worked with one another several times, so this fight should not be hard to make, and the incentive that it would be a unification fight. It would be great if this fight would air on ESPN, but don’t be surprised if it would be streamed on ESPN+ (if it gets made this year). The 21-year-old Munguia, who had a breakthrough year in 2018, will defend his WBO junior middleweight title against Takeshi Inoue on Jan. 26 in Houston. Munguia is expected to eventually defend his title against mandatory challenger Dennis Hogan of Australia later this year. With the Tony Harrison (WBC) and Jarrett Hurd (IBF and WBA) defending their world title belts or even planning on unifying the division in 2019, fighting Munguia may not be in the cards. Not to mention Munguia is co-promoted by Golden Boy (along with Zanfer Promotions) and will fight on DAZN in the United States, while Harrison and Hurd have Showtime and Fox to fight on those platforms. Should Munguia defeat Inoue and Hogan, he could face Teixeira, who is ranked number six by the WBO and is also promoted by Golden Boy. That fight could headline a DAZN telecast in Southern California, Munguia’s hometown of Tijuana, or could be placed on the undercard of a Canelo Alvarez fight in September. Teixeira (29-1, 22 knockouts), who is originally from Brazil and now trains in Oxnard, California, has won his last three fights since his May 2016 loss to Curtis Stevens. Valdez will defend his WBO featherweight title against Italy’s Carmine Tommasone on Feb. 2 at the Ford Center at the Star in Frisco, Texas (the practice headquarters of the Dallas Cowboys). The fight will air on ESPN. It will be Valdez’s first fight since his victory over Scott Quigg on Mar. 10. During the fight, Valdez’s jaw was broken, and during the recovery period, he hired trainer Eddy Reynoso after parting ways with Manny Robles. Warrington had a solid 2018, defeating Lee Selby to win the IBF title. He successfully defended the title with a decision win over Carl Frampton on Dec. 22. Promoter Bob Arum stated before the Warrington-Frampton fight that he wanted Valdez to fight the winner in a unification fight. The fight can take place in the United States or in England, but it would be an excellent, action-filled fight between two unbeaten fighters. This is wishful thinking on my part, but it has been discussed before. This fight could be a stretch and I can see this happening more so than Khan moving up in weight to fight Kell Brook. We shall see after Pacquiao faces Adrien Broner on Ja. 19.